A couple of days ago we decided to visit the Nerja caves. I love visiting stuff like this and do it whenever I have a chance. The caves were absolutely beautiful, it's just a shame that they may not stay that way as most of the people in there seemed to be too stupid to take any notice of the repeated signs forbidding flash photography (this is done because it, as far as I know, damages the pigments in the rock). Presumably for the same reason you could only get into a small portion of the caves and the paintings could only be viewed from pictures in the visitors centre. This is a great shame, but I suppose it's inevitable if people can't be trusted not to be morons.. I would have liked to have been here in about a month as that's when they hold the cave festival where there are musical performances put on down there, which I gather is amazing. Again for more pics, check out my Flickr page. Some of the pictures are less sharp than I'd like because of the afore-mentioned lack of flash. 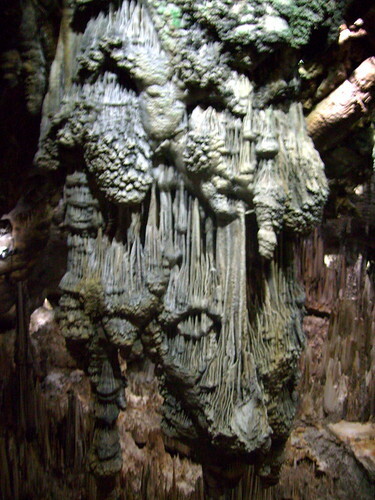 For more info on the caves, have a look at the official site and the wikipedia page. Great stuff. Go and see it, but beware of the mercenary photo people!